Linking up with Kellee & Jenn at www.teachmentortext.com for their weekly meme. This week was a slow week of reading for me (again). Being sick & back in school makes for a not so great combination! I read only these 2 books. I adored Necromancing the Stone. Seriously adored it. 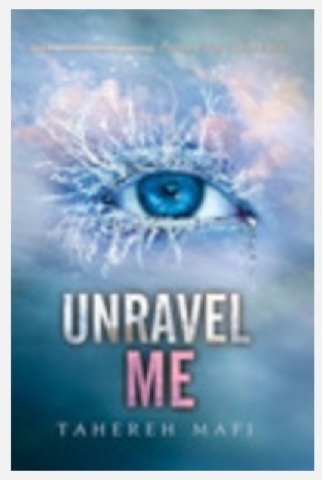 This week I'll be reading UNRAVEL ME and I can't wait! Thanks to Kathy for hand delivering it to me Sunday evening and Jillian for sending it on the #ARCtour. Sorry you had a tough week with beginning & being sick. Not a good combination. I will need to look for this last one-it's new to me. The Angleberger I know about. It must be good! Is that the sequel to Hold me Closer, Necromancer? I just added that one to my TBR pile on my kindle! Can't wait to read Necromancing the Stone. Loved Hold me Closer, Necromancer. Ugh. Rough start to your school year. Hope you're feeling better soon. 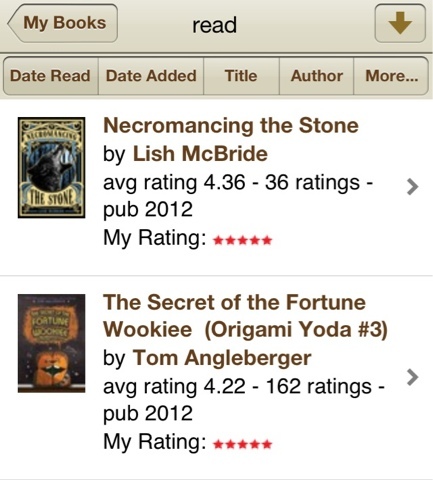 Can't wait to get to Fortune Wookiee now that it's out of my third grader's hands with a glowing review! AH!!!!!! I am so jealous that you read Necromancing the Stone! I love Hold Me Closer. Wish more people knew of it!